S.W.A.SHAH: ETHNIZITÄT, ISLAM UND NATIONALISMUS – AFGHANIC e.V. Diese Untersuchung hat die Politik der Nordwestgrenz-provinz im noch nicht geteilten Indien zwischen 1937 und 1947 zum Thema. Diese war die einzige Provinz mit Moslemmehrheit, die den Indischen Nationalkongress in seinem Kampf gegen das British Raj unterstützte. indischen Nationalismus sind zentrale Themen dieser Untersuchung. Diese dreipolare Beziehung führte zu Spannungenzwischen dem paschtunischen Ethno-Regionalismus und dem muslimischen Nationalismus, den die All-India-Moslemliga vertrat. 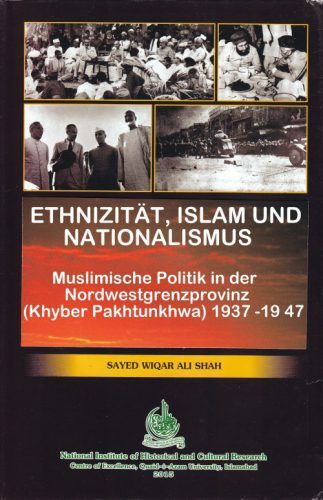 Es geht darin auch um den Aufstieg der Khudai Khidmatgar, darum, dass der Kongress am Vorabend der Teilung das Grenzprovinz-Volk „im Stich gelassen“ hat, um die Entlassung der Provinz-Kongress-Regierung durch M. A. Jinnah und um die verzweifelte Stellung der Khudai Khidmatgar im neuen Staat Pakistan. Congratulations on the completion of the book. This will be acknowledged by the German readership also that you did a great job. Not many people are aware that side by side with the great Gandhian non-violence movement there was another big movement in the Pashtuns which emphasised upon not only non-violence but their motive was ‘Service to the humanity’. Among the warring Pashtuns it was really very difficult to preach non-violence who later on adopted it as their creed. In the neighbouring Punjab, another Muslim majority province, during the Partition days (August-September 1947) violence erupted and despite all tall claims of a cross-communal organisation, the Unionists failed in curbing violence. According to a careful estimate more than 1.2 million people lost their lives. But here in the North-West Frontier, where the Khudai Khidmatgars were in power, no large scale violence was reported. The whole process of migration was peaceful and without blood shed. I met many people in India who migrated from Frontier, they always mentioned their villages and towns with tears in their eyes and still remember how the volunteers of Khudai Khidmatgars saved their lives, even at times risking their own lives. This is an excellent effort and I am sure the students and scholars will benefit enormously from your effort. With your permission I will forward this email also to my colleagues and friends in Heidelberg University and will request them to circulate it in a proper way (also to give it on the SAI newsletter) so that more people should know that now the book is available in German language also. Have a nice time. Lot of regards. Auch in der Deutschen Nationalbibliothek als pdf erhältlich.